Highlights were a 2 young apache Northern Goshawks (boy, are these monsters!! ), the long-staying Tufted Flycatchers at Ramsey Canyon, Band-tailed Pigeons in upper Carr Canyon, a Black-capped Gnatcatcher nest with 3 young at the parking lot of Florida Canyon (thanks and good to see you, Jake! 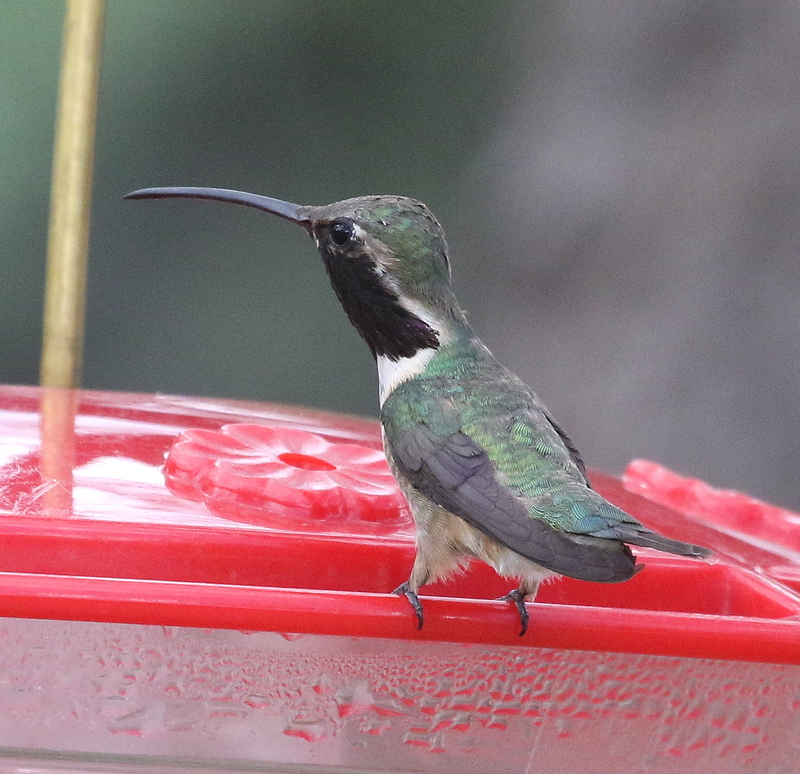 ), Lucifer Hummingbirds at Ash Canyon and 2 active Northern Beardless-Tyrannulets at Florida Canyon. 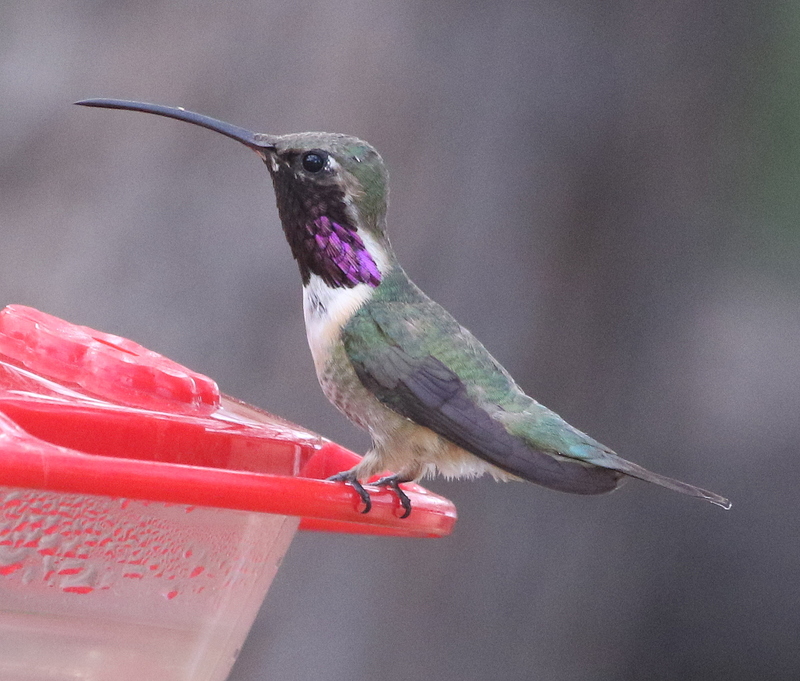 Lucifer Hummingbirds are pretty easy at the Ash Canyon B&B this time of the year. 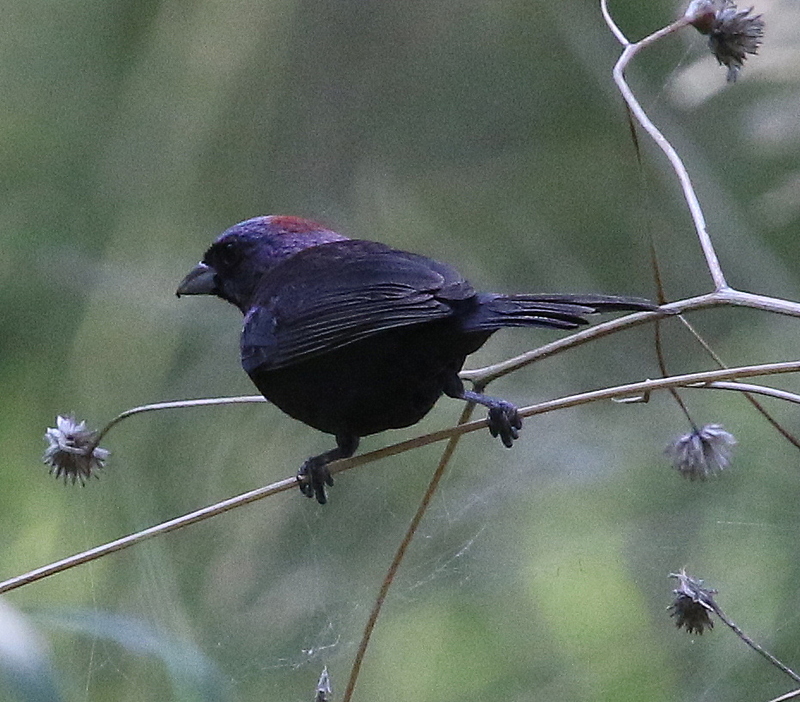 Mary Jo’s feeders are always a highlight of a trip to the Huachucas. 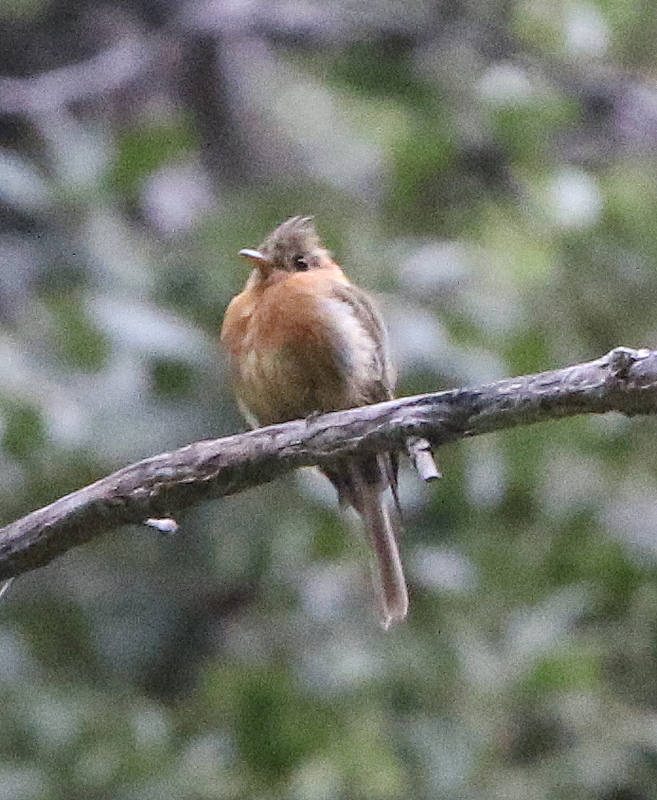 This was a general purpose trip, so I was pleasantly surprised that the Tufted Flycatcher at Upper Ramsey Canyon are still hanging around. Someone pointed out the nest to me. The birds were a 200 yards lower down in the canyon and we only found these birds by recognizing their call. Maybe the highlight was the apache Northern Goshawk juveniles near the intersection of the Hamburg and Comfort Spring trails. This particular bird (I suspect a female) was enormous. I would estimate its length to be around 30in! Eagle sized. 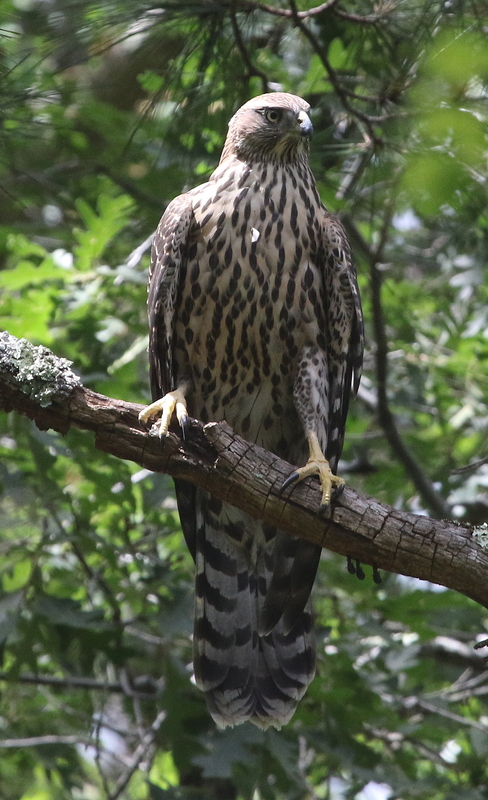 The apache subspecies of Northern Goshawk is the largest which is kind of counter to Bergmann’s rule which states that species in warmer climates are typically on the smaller side. Its sibling was not far off. These birds could be heard for 2+ hours almost constantly. Their call is somewhat like a high-pitch Red-tailed Hawk. A special bird for this time of the year is the Varied Bunting which is still singing hard. Lazuli and Indigo Bunting were not far up the trail at Florida Canyon. 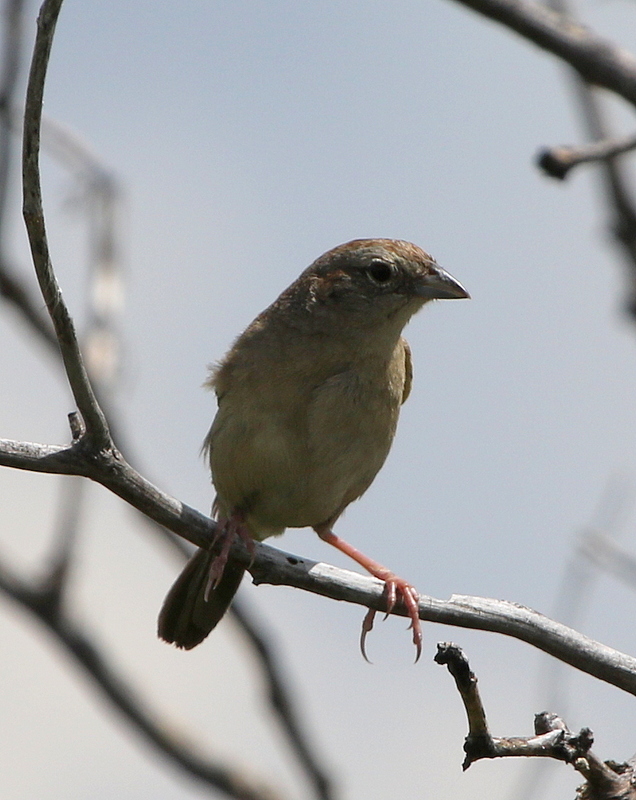 A big bonus of this time of the year is that Botteri’s, Cassin’s and Rufous-winged Sparrows are all singing well. A good spot for all 3 is lower Madera Canyon. This Botteri’s (note the large bill!) was at near Ramsey Canyon & Brown Canyon Rd close to Sierra Vista. ← Previous Post Can you id this conifer? You are right, Stefan. The goshawk is impressive. What a majestic bird! Believe a juvenile Apache Goshawk was perched on my patio in San Tan Valley, AZ. It was looking over my penned guinea pigs. Vertical breast striping was the most noticible characteristic, uncommon among raptors. Perching seemed like an immature behavior. In taking flight undersides were heavily striped with widely banded tail. Bird only flew off a few feet then returned twice checking out my rodents. It was late afternoon. Other possible birds might be Gray Hawk or Peregrine Falcon. Still, the vertical striping makes me think it was an Apache. My patio backs to an open area (wash) with native vegetation.